Welcome to the VUprint information site. 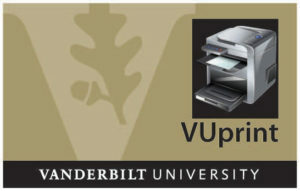 VUprint, Vanderbilt’s pay-for-print service, is designed to provide convenient, cost-effective, and sustainable public access printing to students, faculty, staff and eligible guests at a variety of locations across campus. All public access printers in libraries, most computer labs, and common areas use this system, which is linked to your Commodore Cash account for automatic payment. Upon downloading a Windows or Apple printer driver package, users with a VUnetID can also initiate a print job from their computer by choosing a printer queue (location), entering their VUnetID and password, approving the charges displayed and, finally, picking the job up from the selected printer. Vanderbilt guests who would like to print at a library location, but who do not have a VUnetID will need to purchase a VUprint Visitor Card at the Value Port kiosks in the Central, Law and Music Libraries. Print from any device! No drivers to install!